I imagine countless thousands of amateur cooks have been tempted to make a Battenberg cake this week after watching the contestants on the Great British Bake Off have a go. I used Mary Berry’s recipe, helpfully published on the BBC website. It has made such a tiny cake it was barely worth bothering with! We will be hard pressed to get six slices out of it. I don’t have a square tin, so had to use loaf tins, which worked pretty well. The mix barely filled them, and the cakes weren’t square at the end. It took quite a bit of cutting off to get something even vaguely square. I was too hasty with licking out the buttercream bowl and missed instructions about extra buttercream needed for the sides and top, hence why the walnuts are poked into the (shop-bought) marzipan Stegosaurus-style. I have been busy telling myself it was a huge waste of time for such a tiny amount of cake and I will never take on so foolish a project again… when I just happened to see a Choc-Orange Battenberg Cake recipe mid-google and starting thinking hmmmm…. all over again. Anyway. Put these foolish frippery battenberg fancies out of your mind and make this gorgeous boiled fruit cake instead. This makes a good, honest, large fruitcake that will easily serve a goodly number of friends or do a fortnight’s worth of packed lunches. It’s my mother’s recipe. When I was home with my parents for a week in August, I learned that their century-long recipe, which has made hundreds of fruit cakes for packed lunches had been superseded, and now they alternate between “light” fruit cake and “dark” fruit cake, both made in double batches and frozen until needed. Below is “dark” – I have lost “light” which is nice enough, but so familiar as not to feel terribly special. Casting your eyes down the list of ingredients for this makes you think it’s just a bog standard fruit-cake. Nothing on the list sticks out as making it taste as special as it does. But something magic happens in the cooking, giving this cake a stickiness, a darkness and punchy taste whose origin I can’t figure out. 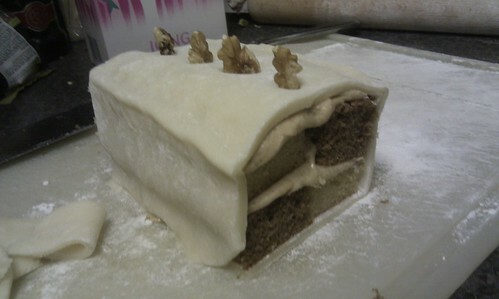 And hey, if you want to mess around with marzipan and decorations, better to do it with a fruit cake than a Battenberg! Prepare a deep 7″ cake tin with a circle and shoulders of greaseproof paper or ready-make Lakeland liners. Put all ingredients except eggs and flour into large pan and bring to boil. Simmer for 1 minute, allow to cool to below egg-scrambling temperature. Tip the pan into the mixer and add the eggs, one by one, followed by the flour. Mix on full until fully combined. Tip into pan and bake in a cool oven for around an hour. Double check the oven long before the end of cooking time and adjust recipe for your oven. Benefits from a slow bake in a low oven.